Who exactly was this movie intended for? I couldn't help but to keep asking myself this as Maleficent played out, unsure of what it wanted to be, completely torn between two drastically different tones. 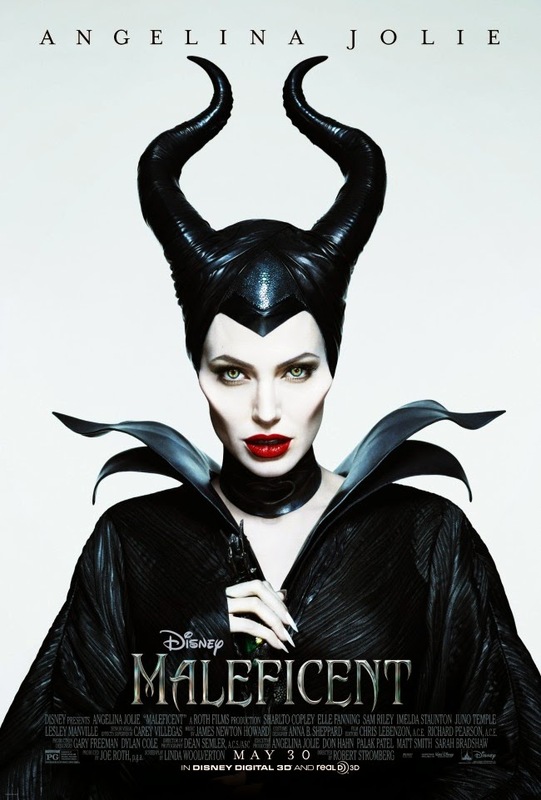 There was naturally something interesting about this different approach to the current trend of re-telling classic fairy tales in live action form and casting Angelina Jolie as the titular villain guaranteed nothing short of a fair amount of interest but the final result we've been delivered is nothing but a badgering of the original Disney animated film that proves trying something different is truly hard to accept if it isn't done right. While it is easy to give credit to the machine that is Disney for at least attempting to think outside the box rather than simply bringing the same story to the screen with real-live people (though it looks like 90% of the film is CG anyway) Maleficent is actually less innovative than Tarsem Singh's 2012 take on the Snow White tale. At least that movie had a different rhythm to get in tune with while here we get exactly what we expect and even a little less depending what age group you belong to. So, it was a strong idea with factors that lent themselves towards what could have been an interesting execution yet what we have as the final product is anything but substantial and a film trying to be so many different things it ends up failing on all levels. This brings us back around to the question of who might this movie actually be targeted at? There were certainly a lot of children at the screening I attended, mainly young girls, and throughout you could hear them giggling at the intended bits of comic relief and gasping as Jolie re-created the famous scene in which Maleficent casts her spell on the young princess. To those reactions I began to wonder what I might have thought of this had I seen it as a child. Would it have been one of those my parents might have bought when it came out on VHS and I re-watched over and over? The only equivalent I came up with was Stephen Sommers 1994 adaptation of The Jungle Book that also came from Disney. It was very much a children's film while playing on the darker tones of the Rudyard Kipling story and that is what first-time director Robert Stromberg (yes, they entrusted this summer tentpole to a first-time director) seems intent on doing here as well, but his over-reliance on special effects and muddled screenplay do nothing but disservice what vision he might have had. 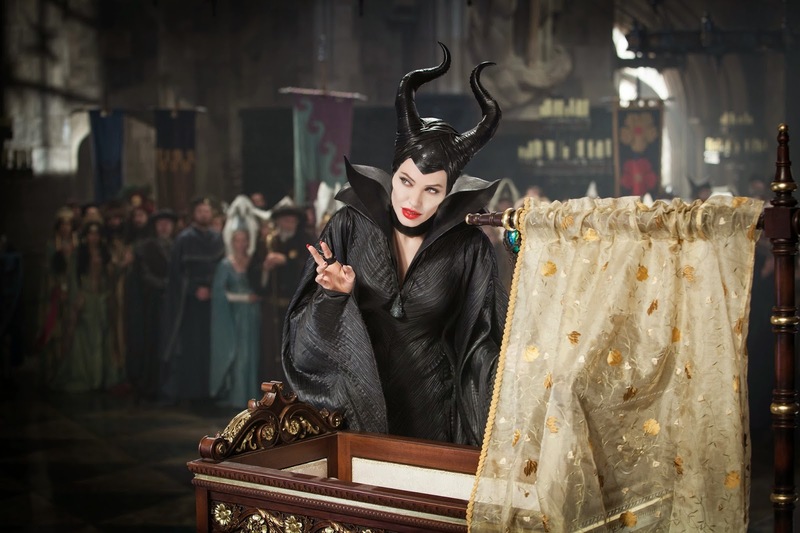 Maleficent (Angelina Jolie) visits baby Aurora on the day of her christening. From the beginning it is immediately evident one too many hands dipped into the screenwriting pool on this one. There is only one sole screenwriter credited on the project (Linda Woolverton who has contributed to countless Disney productions since the late-80's) but there is not a doubt in my mind a committee of Disney big-wigs wrote as much of this script as Woolverton did on her own. We are awkwardly fed the backstory of why a divide exists between the moors, a fantastical place where mythical creatures such as Maleficent dwell, and the human realm. They don't trust one another and the creatures of the moor are hesitant to let any human get close enough for fear of what they might bring to their peaceful, free-spirited way of life. One day, a young boy by the name of Stefan shows up though and Maleficents' heart is weakened by an act of kindness towards her. Maybe humans aren't all that bad she considers. As they grow older they become close friends and as their friendship develops so unavoidably do deeper feelings. Nothing amounts of these affections though as Stefan becomes consumed by the thought of power within the human realm which in turn alienates him from the moors and the young fairy who would have given him her heart. With no connection to the bloodline of the throne Stefan gets lucky when the king proclaims his hate for Maleficent (quite randomly it should be noted) and promises that whoever kills her will be rewarded with the crown. Stefan uses his relationship with Maleficent to "get an in" only to betray her trust by clipping her glorious wings and taking them to the king to claim his rightful place as the successor to the throne. This act will cost him though as the loss of her wings spurn Maleficent into a life of hatred fueled by revenge and to this extent I was still along for the ride with the film. It is from this point out that it goes from a work-around of the 1959 animated feature to more of an excuse to just make up an alternate history. We see Aurora (Elle Fanning) grow from a child to a beautiful young woman while hidden away in the woods with the three good fairies, Knotgrass (Imelda Staunton), Flittle (Lesley Manville) and Thistletwit (Juno Temple), as Maleficent and her faithful sidekick Diaval (Sam Riley) watch over Aurora rather than try to locate her for sixteen years while the introduction and rendering of Prince Phillip (Brenton Thwaites) may as well have been neglected altogether. None of these inconsistencies might have bothered me as much if Disney had not also produced this film, but the fact that they did and that so many elements of this new iteration mirror the '59 animated film don't add up is frustrating. They essentially forget the original narrative and substitute the second and third acts with material that would be impossible when taken in the context of the original feature and the feature most of the audience will no doubt go in referencing. The point of coming at this story from a different perspective not only was engaging because it felt fresh, but it allowed for Disney to continue its theme of placing the savior prince on the outside of the fence and illustrating to young crowds that there exists a different, equally powerful type of love that resonates between those who care for one another with no intent other than to be a part of each other's lives. It is a fine stance that Frozen delivered successfully but Maleficent falters on because it's grounded in such a dull, uneven story where we don't care about the characters or their fate no matter how much things either align or have been changed from the point of reference. This brings us to the main issue with the film, that being the script. We are given the outline for what we've all known in the back of our minds as the Sleeping Beauty story and that Maleficent was an evil witch who would stop at nothing to make sure the curse she placed on the innocent Aurora was carried out without a glitch. There was no way around the fact that these were Maleficents' intentions yet Maleficent wants us to believe that it was a very different set of circumstances that led to these events and the story Maleficent tells only matches what we've heard previously up until about a half hour in. Now, I can accept that these are just two completely different versions and that details have been changed to get the audience to sympathize with certain sides, but what I can't forgive is a film that is nothing but dull because it can't even come up with an alternate set of events that challenge the entertainment value of the other story. While Maleficent essentially calls Sleeping Beauty a liar that film at least had things going on, scenes that built on one another while this new version simply floats along waiting for those major events to occur so that they can hit the beats while Jolie hangs out in the woods creepily watching over Aurora. 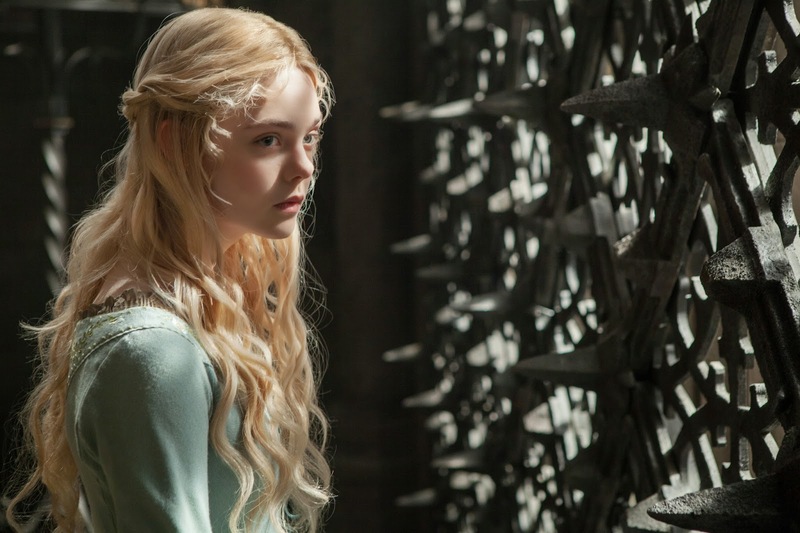 Aurora (Elle Fanning) doesn't feel she belongs in her fathers castle. This complete lack of rhythm could just as much be due to the uneven feeling of the editing and pacing, but I have to think that no matter what it ultimately comes back to a poor script with not enough to say. It is a good kernel of an idea, a nice thought to ponder, but unfortunately Woolverton wasn't able to come up with enough to sustain even the brief hour and a half running time that feels as if it drags on well past two hours. All of this being said, there are a few redeeming qualities to talk about here. First and foremost is the fact the film looks great (though it is too close to the aesthetic of Alice in Wonderland). Whether it be Jolie all dolled up in big bad baddie form or the large CG environments that have tree creatures crawling from the ground or the shot that Stromberg (who was a production designer before getting this directing gig) likes to return to where Maleficent soars above the clouds and then hangs there like a female Superman which are truly breathtaking. Still, everything is so oddly paced and contrived we never get the chance to really appreciate it. The scenes in which there are hoards of men and creatures rushing towards one another in battle and dragons breathing fire over soldiers only feel as if they've been included because a movie like this should have scenes like that. It is a cobbled together miss that never feels like a cohesive work, but more an experiment in how many dark undertones could be implied while still maintaining the facade of a kids flick. As for the performances themselves this should have been all about Jolie and her relishing in this outlandish character, but only in a few scenes do we catch a glimpse at what could have been. Otherwise, all they have to go on is the iconic imagery of the horns and the cheekbones and the silhouette that is played to the hilt, but nothing more ever comes of it. Yes, we get it, she looks great and it's really cool to see Maleficent brought to life, but you've got to have more to offer than that. Everyone else here seems to be grasping at straws because they are given nothing to go on and no arcs to play. Fanning and Riley simply exist in the shadows of the main character, beckoning to her every call, but are not fully formed individuals themselves. Sharlto Copley as King Stefan gets the worst of it in what should be as diabolical a role as Maleficent was in the animated version, but instead we feel absolutely nothing for him and his strange accents. To shrug this film off is to feel as enthusiastic about it as you can which is a shame because it's clear there was a lot of effort put into this in certain areas, but unfortunately not in the one movies live or die by.